Boba Fett is arguably one of the most popular characters in the Star Wars universe. His reputation as a steely, inscrutable intergalactic soldier of fortune has earned him a special place in the vast coterie of characters from the films. I was a fan from the beginning, when he first appeared as part of the infamous Christmas Special in 1978. I raged at his apparent and appalling demise in Return of the Jedi. I suffered through the garbled course of events that attempted to explain his origin in the second trilogy. But my connection to the character remained. With an equal balance of love and those above-referenced injustices in mind, I’d like to present my latest creation, The Ballad of Boba Fett. I hope you have as much fun reading it as I had writing it. For those of you who might be interested, “Behind The Ballad of Boba Fett” contains further musings on my complex relationship to this enigmatic character. It immediately follows the poem. Called by the French Boba Fett. ‘Cause he just couldn’t find Ray-Bans there. Boba Fett was the first significant character to be added following the original movie in 1977. 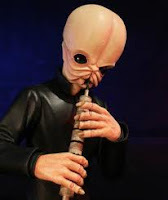 For all of its many faults, the Star Wars Holiday Special of 1978 provided fans with the first glimpse of this new character and the type of role he might play in the sequel. In the television special, he appears in cartoon form as part of an animated segment. 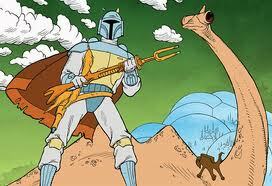 In it, Fett rescues Luke from an attacking sea monster after Luke’s y-wing crashes on a moon covered in goopy red fluid. Having saved his hide, Fett further offers to help him locate Han and Chewie’s ship, the Millennium Falcon, which crashed earlier in the same vicinity. When they find the ship, they discover that Han has fallen victim to some mysterious ‘talisman’ and is unconscious. 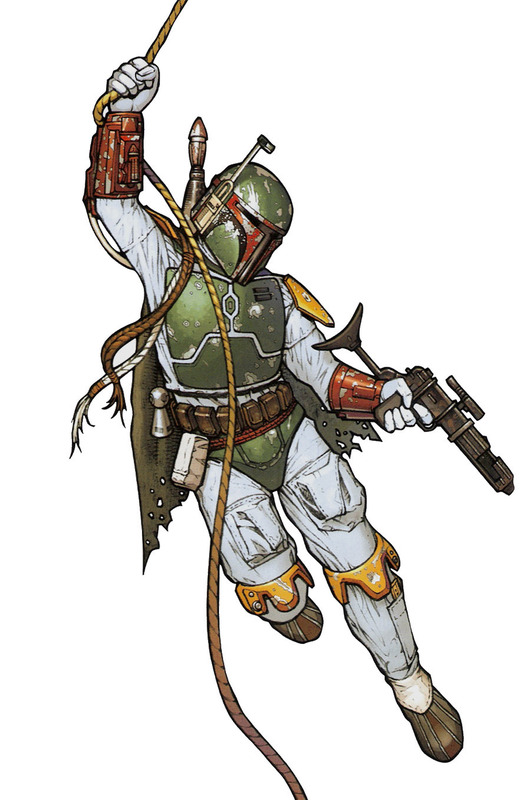 Fett generously volunteers to travel to the nearest city, which is under Imperial control, and obtain an antidote so the heroes can remain hidden. While in the city, Fett contacts Darth Vader to inform him that their plan is working, that he has gained the confidence of the rebels and will soon be able to provide the location of their new hidden base. Impressed, Vader notes Fett’s reputation as the “best bounty hunter in the galaxy.” Luckily, R2-D2 and C-3PO intercept the transmission, and after his return the heroes confront Fett, who makes his escape, vowing to meet again. Looking back at it now, many things about the tale don’t make any sense, but at the time, my imagination latched on to the character’s bold, deceptive, resourceful personality. Got 9 minutes? You can watch Boba Fett's premiere for yourself. It's times like this when I think youtube is the best thing ever. Around the same time Kenner, the toy company that made the Star Wars action figures I collected like precious gems, unveiled a promotion where you could get your own Boba Fett figure (not available in stores) by sending in six (or whatever it was) proofs of purchase. Luckily, I had carefully preserved all of my figures’ cardboard backers in a shoe box as part of my most-secret treasure trove of valuables. I snipped out the required number of proofs of purchase, wrote out my mailing information on a blank index card, prayed as I sealed the bulky envelope that it would make it safely to its destination, and placed it where the mailman couldn’t miss it (in the mailbox). All these years later, I still believe that those were the longest six to eight weeks of my life. I checked with my mom every day after school to see if my Boba Fett had arrived. When it finally did, I opened the small, plain cardboard box to find a bluish/grayish/purplish plastic figure, with red, yellow and green painted details. Included in the box was a notice from Kenner explaining a design change in which, for safety reasons, they eliminated the missile that was supposed to fire from his backpack and replaced it with a glued-in, stubby red spike that looked suspiciously like the thing that would pop out whenever Rascal, my Schnauzer, got too excited. Firing or non-firing, with my own kind of excitement I absorbed every detail of his three-and-a-half inch multi-colored body, my imagination immediately setting to work, conjuring up mysterious dealings and dramatic confrontations with the heroes. 1980’s The Empire Strikes Back delivered Boba Fett and his metal-clad body armor to the big screen, and fans were not disappointed. Although he had only five speaking lines in the film, the way he carried himself, the way he stood, his silent gunslinger reserve all pointed to a man of supreme and lethal confidence. You could tell just by watching him operate that he was capable of doing just about any dirty deed you needed done, for the right price. 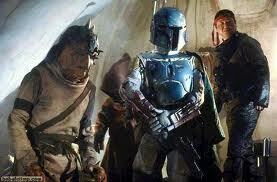 Fett’s presence was quietly menacing in a way that served to counter Vader’s angry ruthlessness. In some ways his lack of expression, visually and verbally, made him nearly as intimidating as the Sith Lord himself. In addition, Fett didn’t cower before Vader the way everyone else did, and Vader seemed to view Fett with less contempt than others, perhaps even verging on respect. They were never partners, but they seemed to have a mutual understanding of each other’s interests, and a willingness to accommodate them as long as they weren’t at cross-purposes with their own. In Empire Boba Fett lived up to the persona of my imagination. He was the only one smart enough to outfox Han; and in doing so, he was responsible for the chain of events in which Vader would reveal his paternity test results to Luke, C-3PO would be blasted into neatly segmented chunks by stormtroopers, Chewie and Leia would be taken captive (at least until thwarted by Lando’s unpredictable act of semi-selflessness), and Han Solo would be frozen into a miniature monolith and carted off to Jabba. 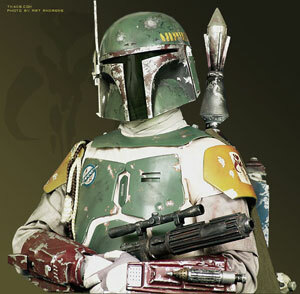 Boba Fett was the epitome of a smart, calculating killer; he was cold-blooded cool personified. And as fans, we couldn’t wait to see what he was going to do next and how his character was going to factor into the storyline of the last film, Return of the Jedi (ROTJ). Then, in 1983, we saw the movie. Now I had always assumed, based on the evidence available to us fans, Fett to be a loner, a kind of superstar gun for hire that roamed the galaxy with virtual impunity, an independent contractor of a very specific kind whose stellar reputation meant he was constantly in demand. Admittedly, this interpretation was as much as anything the product of some interpolation of known facts combined with a liberal amount of imaginative embellishment. But I simply never envisioned him serving as Jabba the Hutt’s lead attack dog, which is pretty much his position at the beginning of ROTJ. There was something about seeing him loitering around Jabba’s palace like some kind of mall cop that didn’t feel right. But, whatever, he was there, so you just knew something cool was going to happen. Then we come to Jabba’s barge scene, where Luke and friends are to be executed in a waterless version of walking the plank. However, Luke and R2 foil Jabba’s efforts, and chaos ensues as the heroes clash with a bunch of ugly henchmen. Alright, I remember thinking, this should be good. Fett’s right there on the skiff with Han. This is Han’s chance to settle the score for not being able to scratch his itches for all those months he was frozen, not to mention the continuing unpleasantness of hibernation sickness. 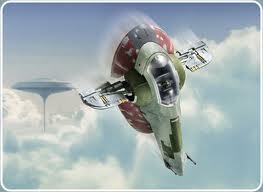 And won’t it be cool to see how Fett counters this in his cold-blooded, efficient way? That was literally the thought that was hanging in my mind when Han, whose symptoms of hibernation sickness included lingering blindness, accidentally smacks Fett in the back with a pole, igniting the thrusters of his jetpack, which send him rocketing into the side of Jabba’s barge. His crumpled form slides down the side of the ship and plummets into the Sarlacc’s waiting maw. His demise is posthumously marked only by a belated belch from the monster. I rubbed my eyes because that’s what you do when you don’t believe them. Wait, I thought, looking around the theater in confusion. 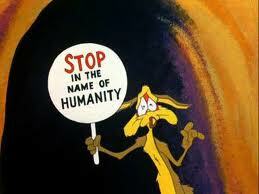 When did this become a Wile E. Coyote cartoon? I never did get over that travesty. Many people were annoyed by the Ewoks; I hardly noticed them. I was still in a state of shock over the slapstick demise of Boba Fett. It was a terrible way to go, and most terrible of all, it wasn’t even good slapstick. It’s been almost thirty years since the ROTJ debacle, and I think you can probably tell that the pain continues to linger. At any rate, after finding out that I have a blog, my therapist suggested that I try putting my feelings into words, believing it may be the final key to releasing my grief and getting on with my life. Awww, we are big Boba Fett fans in our house! I am cursing myself for spending $50 and many hours on-line to find a ‘realistic’ Boba costume (not for me, for my pint sized fan…. 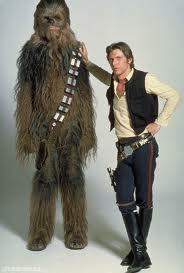 I’m more of the Wookie type) when I now realize I could have just gone to Old Navy! 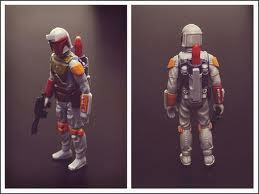 However your story of meticulously saving up UPC’s and patiently waiting months for snail mail for your Boba Fett action figure made me feel much better, since I got the same vintage action figure (for above mentioned pint sized fan) for $2 in 2 days on ebay. Unfortunately, you need the Town&Country Hyperdrive edition minivan to reach Old Republic Navy, not to mention a time machine. Lastly, did your vintage Boba Fett come with velour shirts, Charlie's Angels trading cards, and Disco Duck, because mine did! Too funny! Your account of the aquisition of your action figure is rivaled only by Ralpie's yearning for a Red Rider bb gun in "A Chistmas Story". Love it. I am not fit to wash the feet of "A Christmas Story." But as a compliment, I'll take it. I'll not only take it, but I'll put it in the vault, and someday, when I'm a crusty, doddering old blogger, I will take it out and cherish it all over again. Thanks so much!